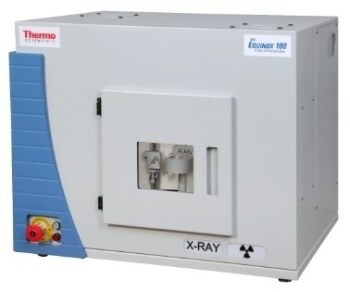 The ARL™ EQUINOX 100 X-Ray Diffractometer from Thermo Scientific™ is a dedicated XRD instrument intended for academic, QA/QC, and routine X-ray diffraction applications. It is a compact, inexpensive device that occupies a third of the space of a standard diffractometer. This X-ray diffractometer is a stand alone, transportable bench top device that offers true flexibility and does not require external water cooling. It can be plugged into a standard electrical power outlet. It simplifies operation and does not sacrifice performance or speed. This instrument completes measurements in seconds and saves operating conditions in the software. It features a unique EQUINOX curved detector that measures all diffraction peaks simultaneously across a broad angular range. Analysis of most of the samples is completed in just a few minutes, regardless of resolution requirements. Consists of a number of sample holders, including a capillary sample holder for transmission mode, a spinning sample holder for transmission and reflection mode, a small thin layer attachment, and an automatic six-position sample changer. Applications: Environment, mining, metallurgy, education, research, geology, cement, and pharmaceuticals.